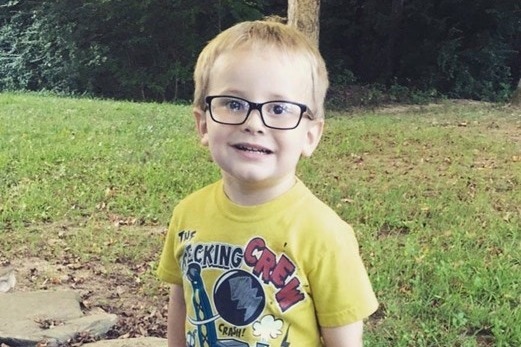 We set this go find up so if you can not make it to the georgia grundle run 2 and would still like to donate here is your chance to help Noah Leigh Barnett. He’s the toughest kid I know, and has the sweetest smile. He is also blind in his left eye. In October of 2016 we noticed a spot in the iris of his left eye. What started as a spot grew into a tumor that collapsed his lens, detached his retina, taken over his iris, and diminished the possibility that he will ever be able to see out of his eye again. He has had a full leukemia workup, done a bone marrow biopsy and aspiration, MRIs, CT Scans, XRays, multiple invasive eye surgeries, and more blood work then I have in all my time on Earth. He has seen an ocular oncologist from the first stages of the mass until now, several specialists, and a world renowned doctor in Philadelphia. None of which have been able to diagnose our boy. The only thing that they can all agree on is that Noah Leigh, our sweet blue eyed boy, is going to lose his eye. They are trying to hold off on the procedure as long as they can but as his eye has stopped growing and the socket hasn’t, it is only a matter of time. It has been a struggle to keep Noah insured as we make too much for assistance but not enough to cover the medical bills that keep coming in. Between surgery and the prosthetic we’re looking at more than we’d be able to save by the time his surgery is scheduled. Thank you to everyone who helps Noah and his family are greatly appreciative!!! !